We also get requests from artists for framing….above is an image by Nancy Tost at the Vintage Beards exhibition at Xanadu winery earlier this year. Bark edge pieces won’t always reveal their secrets until the timber is sawn & dressed and the end result may not always suit. 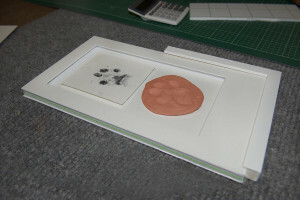 Therefore, to obtain the best result we are also prepared to create a few frames as options to decide upon. 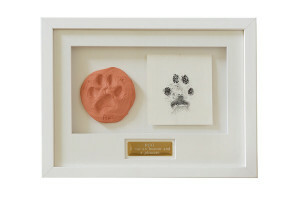 We discuss closely with our clients how they wish their special items to be framed; above is the precious memories of a family pet. It was only later that a brass plate was added which included some special words.